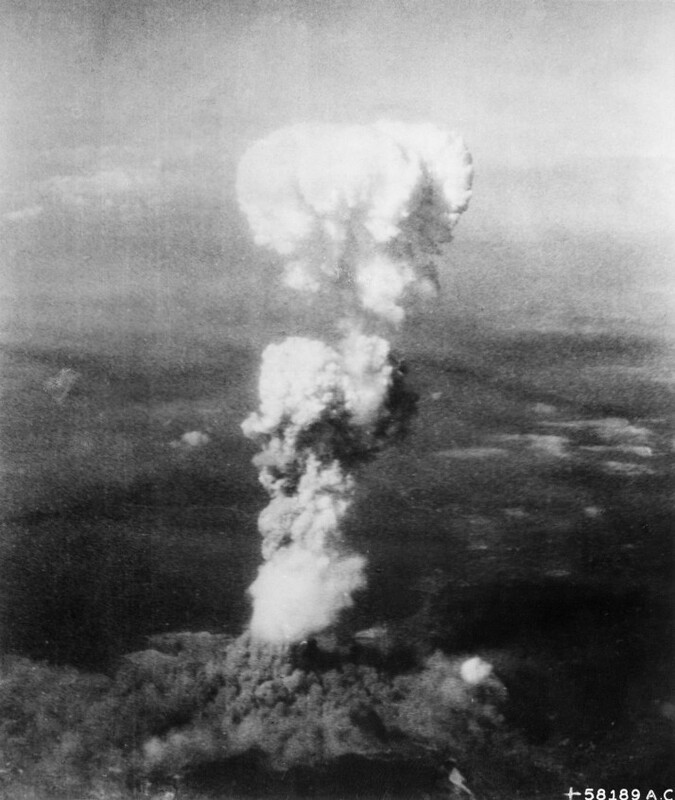 Hiroshima. It’s on the list of places you already know about, and synonymous all over the world as the target of the first atomic bomb. I wasn’t sure what to expect of Hiroshima before we arrived – obviously there are the memorials and museums dedicated to telling the story of the atomic bomb – and I’d read that the rebuilding of the city was swift, but the only photo I’d seen of Hiroshima was that of the mushroom cloud taken from the Enola Gay on the 6th of August, 1945. 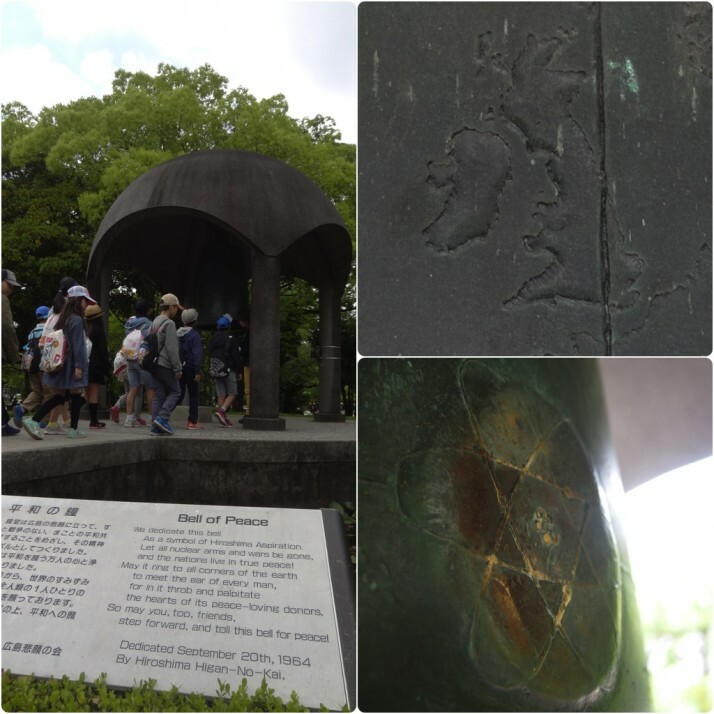 We devoted a full day to take in the sights of the atomic bomb, starting at the hypocenter – the spot directly under the centre of where the “Little Boy” bomb detonated 580 meters above. 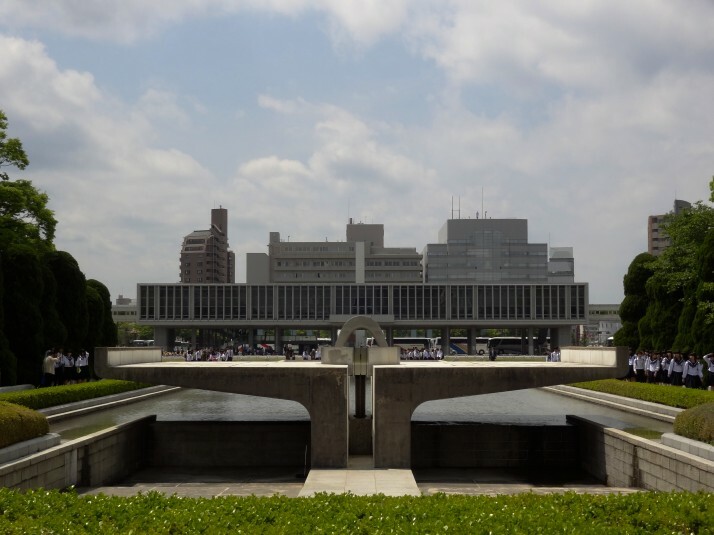 The closest building to the hypocenter that was left standing was the Hiroshima Prefectural Industrial Promotion Hall, which is now known as Genbaku Dōmu, Atomic Bomb Dome, or simply the A-Bomb Dome because of its exposed metal framework. The A-Bomb Dome is an impressive sight. We walked all the way around it and from the riverside it’s possible to see the rubble left inside, as well as the restorative metal support-work that keeps it from collapsing. 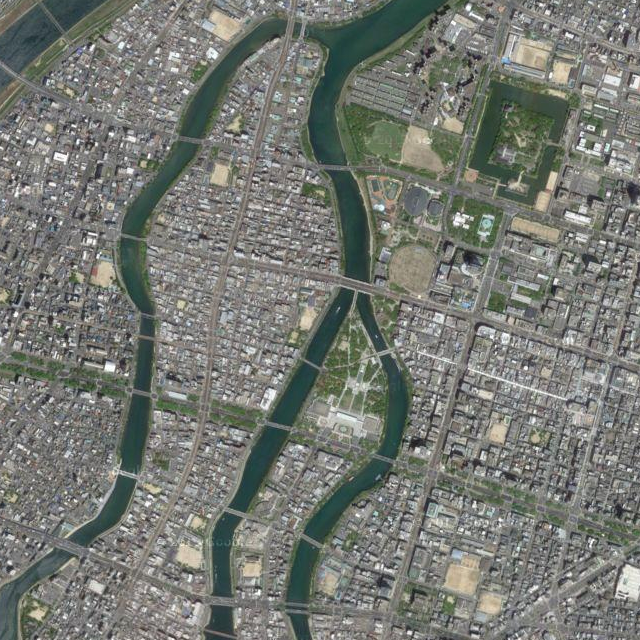 The nearby T-shaped Aioi bridge was the distinctive landmark which the Enola Gay aimed for, and the area directly south of it is now the Hiroshima Peace Memorial Park, a large, green area of monuments and dedications to the lives lost and the hope for a united world of peace. 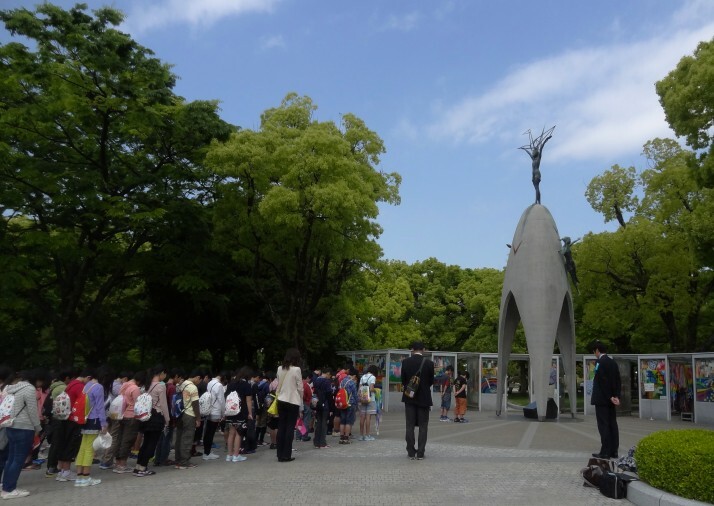 We liked the Children’s Monument which had classes of school-children patiently awaiting their turn to present a thousand origami paper cranes which according to Japanese legend grants the folder a wish. 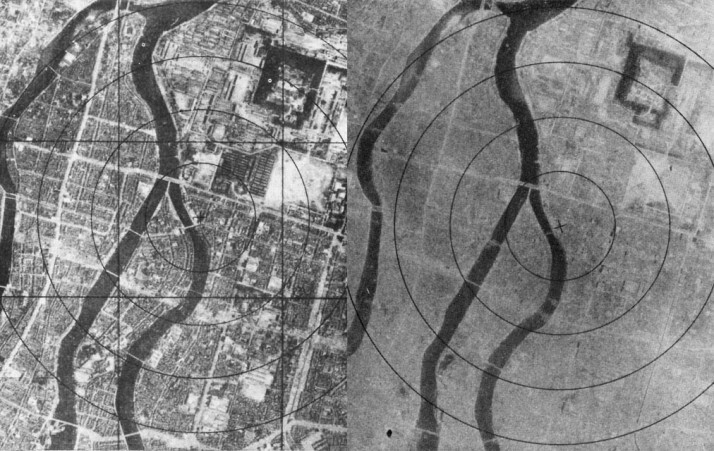 The significance to Hiroshima is through the story of Sadako Sasaki who was defenestrated by the bomb blast when she was two, and died of leukaemia caused by the radiation 10 years later. Each class made a short speech, sang a song, and presented their display of beautiful origami cranes. We also liked the Bell of Peace, which is cast with a map of the world that doesn’t have any border lines. Ironic that at the time of our visit, Scotland are about to vote on formalising theirs.. The museum wasn’t as horrific or heart-wrenching as we were anticipating, although it did have a few graphic images. It’s very factual, well put together, and we learned a lot about the history of the city, the science, the utter devastation, and lingering after-effects of nuclear weapons. 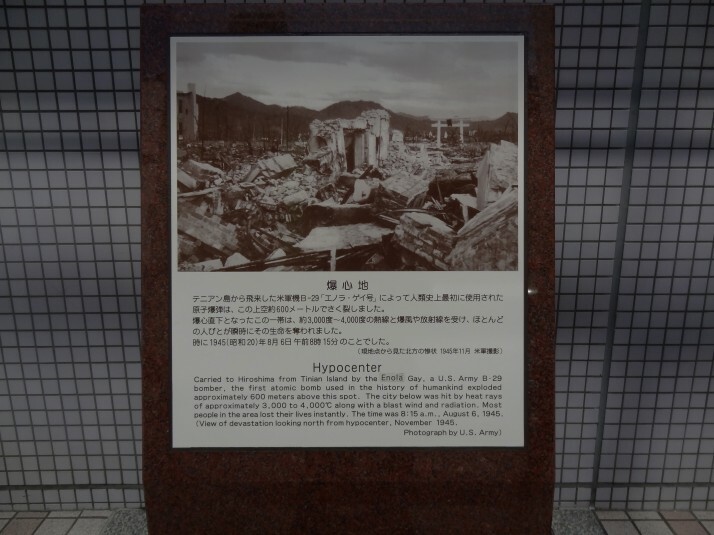 When the mayor of Hiroshima learns of a nuclear weapons test, they write a letter of protest to the respective head of state, and the museum displays a copy. Since the end of the Pacific War to the 30th of October 2013, successive mayors have written 606 letters. 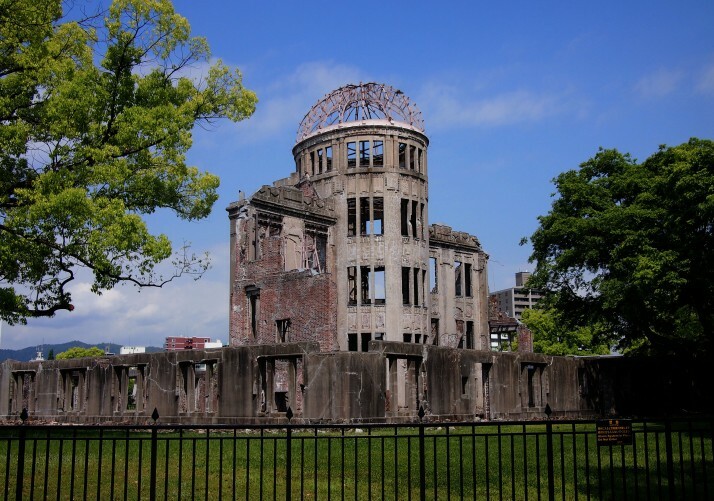 We wondered, like so many other tourists, what the mood would be like in Hiroshima. We knew a little of what had happened here and so we arrived with a sympathetically melancholy mood. However, we found that the people who live here just go about their daily business. The streets are full of people in suits of all ages walking and cycling past the multitude of tourists – mostly Japanese – and we came away thinking we were looking hard for an uncomfortable atmosphere that we just didn’t find. Something we did find that we weren’t expecting, is the eclectic array of tramcars. 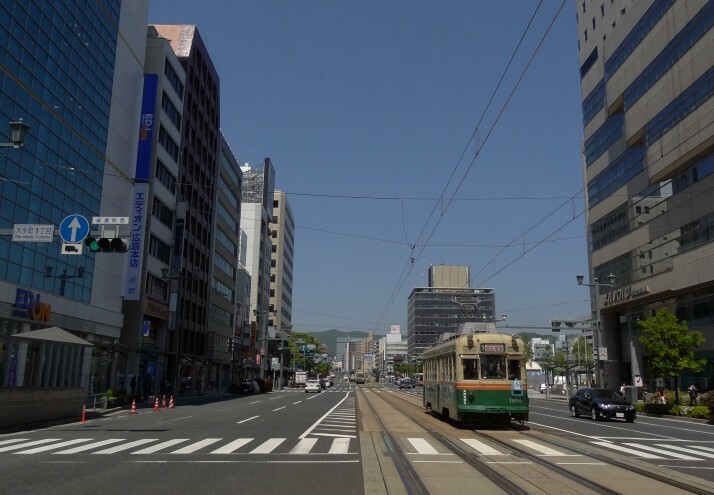 Hiroshima has bought trams from other cities that have closed their tram systems over the years, which has resulted in a sort of living tram museum! 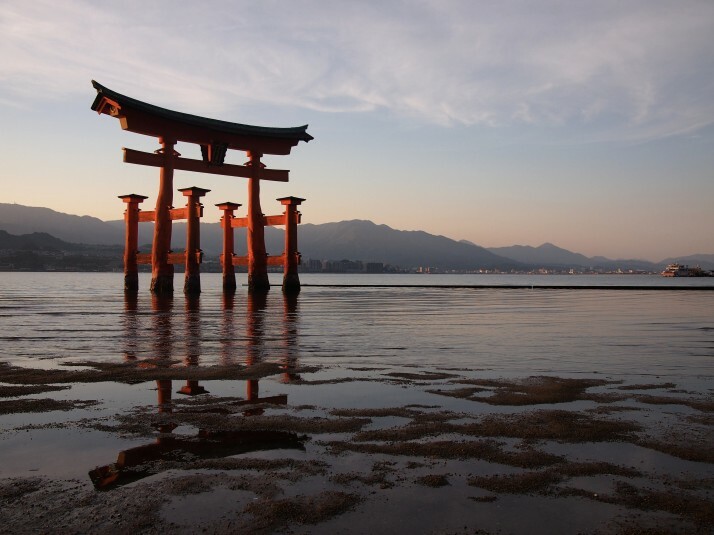 A day trip from the centre of Hiroshima is the small island of Itsukushima, which is also known as Miyajima, or Shrine Island. 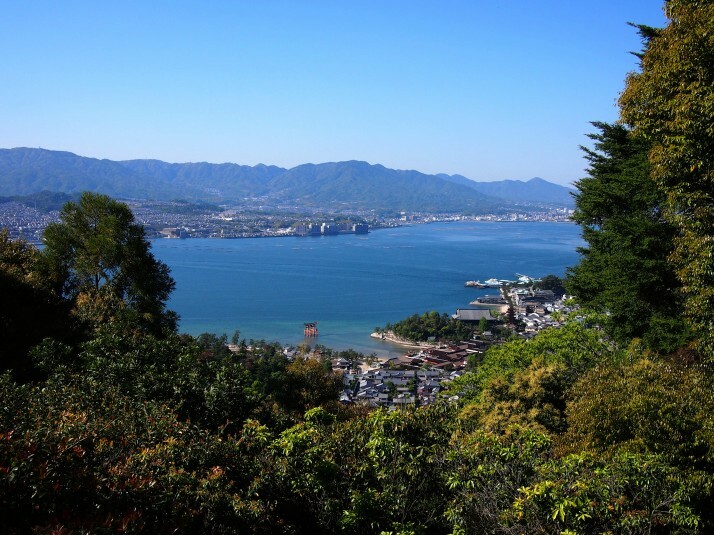 After a short walk through the town, we filled ourselves with the local specialties of conger eel and breaded oysters before setting off to climb the 535 meters to the top of the island’s peak – Mount Misen. The hike was steep in places, but fairly easy going. We made a couple of wrong turns – the first was trying to go through the Daisho-in temple where the map at the entrance clearly showed an exit at the top, but we only found a fence. 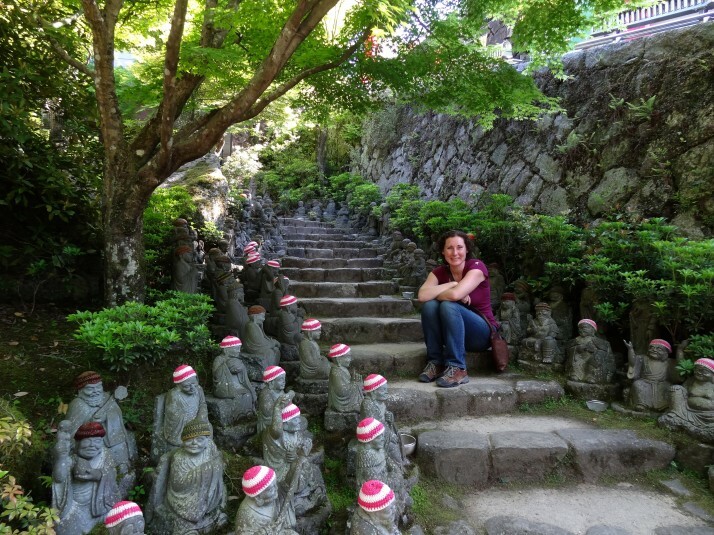 Still, the temple had a very cute figure garden where all of the stone statues had been given knitted hats! 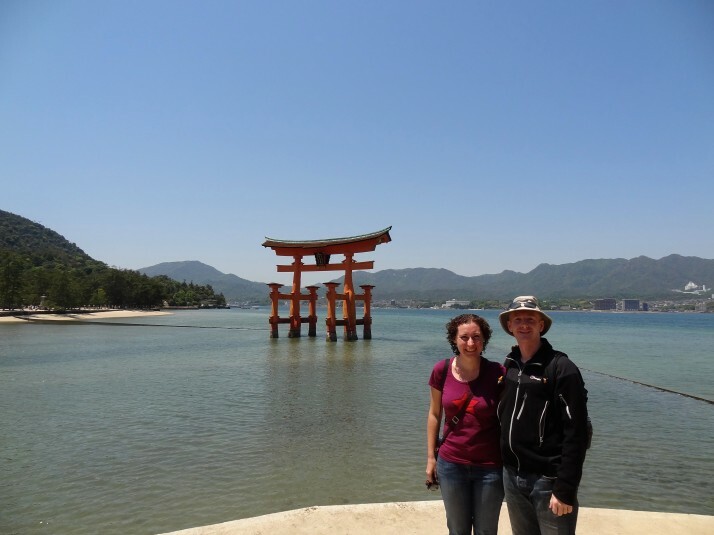 We took the Daisho-in route up and the Momijidani route down, and our timing was perfect to catch the sunset and low-tide at the shrine before our return ferry to Hiroshima. 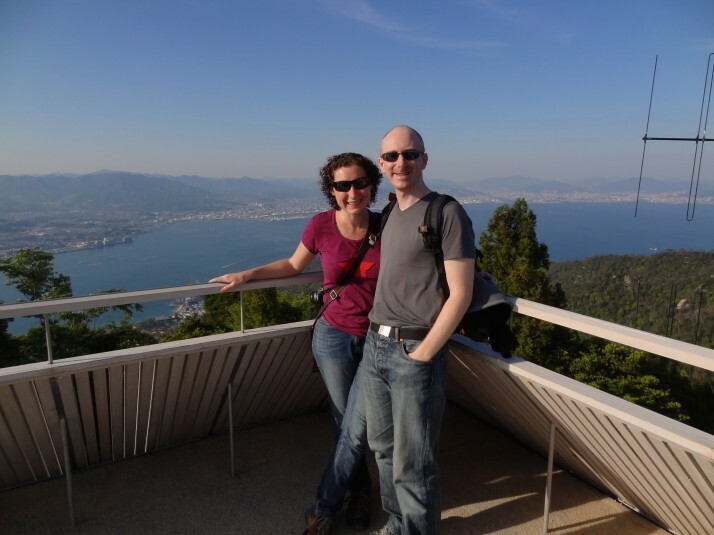 This entry was posted in Places and tagged Hiroshima, Japan on June 12, 2014 by Andrew. What is 22 + 28 ?